Jamaicans are all about making obscenely large amounts of food and feeding their friends and family. This extravaganza typically happens every Sunday! The delicious insanity! I’ve been Jamaican for quite some time now, however I was not raised on the deliciousness that is oxtails. I was raised by a Rastafarian father who kept us on a strict diet of no meat (we ate a lot of fish). Before you all get into some kind of uproar, I would totally put my children on the same diet. The first 19 years of my life were my absolute healthiest. I digress, not growing up around oxtail did nothing to erase my curiosity for this meat. The first time I had it was pretty similar to that of James Wright and his Patti Pie. Just swap out the singing for a nice reggae riddim and some dancehall moves and it’s pretty much the same. I’m sure you’ve noticed that I don’t have measurements for the ingredients. That’s because this dish requires anabundance of flavor and seasoning but you’re more than welcome to tweak it to your tastes. 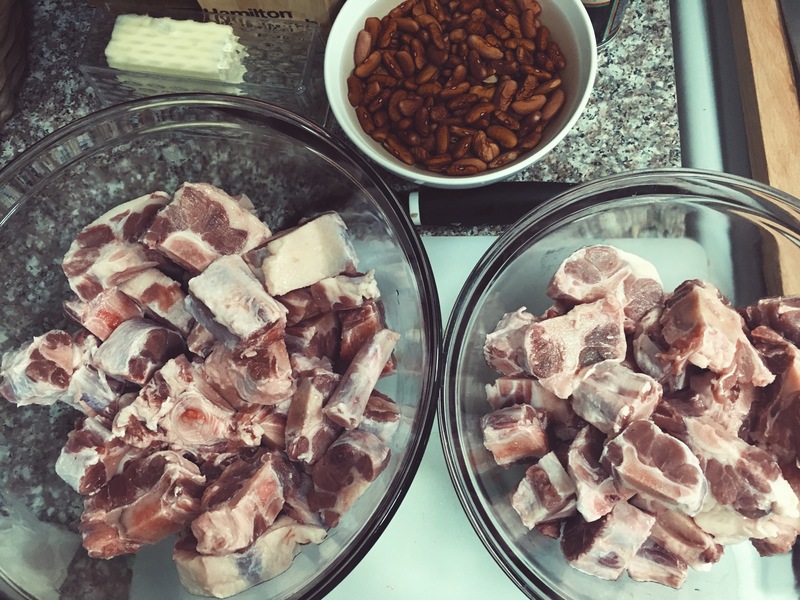 Make sure that you have as little fat as possible on the oxtail. Rinse, drain and then pat dry. Put aside. Halve and then chop onions (green ones too!) Peel and chop ginger and garlic. Add 4 tablespoons of brown sugar to a thick bottomed pot, a traditional Jamaican “dutchie” or enameled cast iron casserole pot will work fine. You want the sugar to burn. It shouldn’t become hard though so keep an eye on it. 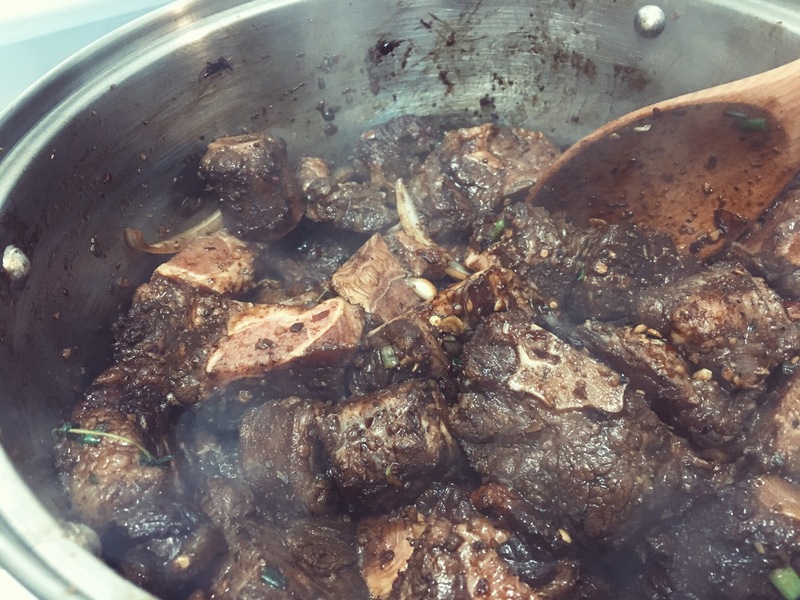 Once the sugar is as dark as possible, begin to add oxtail to the pan in batches. Try not to add the onions. Those come in later. Brown meat and coat in burned brown sugar. Once all meat is browned, add half the onions to the pot and stir. Here’s the deal with the next step, reduce to low heat and let it simmer, adding water whenever necessary. The more water you add, the more soupy the meal becomes. If you are looking to have the meat shine through the sauce don’t fully submerge the meat in water. Add in 1/4-1/2 cup increments. Cover with a lid. After 1 hour of simmering, add remainder of onions. Cook for another 1-3 hours depending on how tender you like it. 3 hours normally works for me. 15 minutes before you plan on taking it off, drain and add a can on lima (butter) beans. This step is optional but very traditional and equally delicious. Serve over rice and peas with salad or avocado. Soak beans in water for at least 3 hours to over night if possible. We need these to soften. Bring water, coconut milk, thyme garlic to boil. Season lightly with salt and pepper. Stir in rice, cover tightly and let cool for 20-25 minutes. Remove garlic and time, stir and serve. "Fiction Friday: The Sun Also Rises"